Since its inception as a Living Lab student pilot project in 2016, the U of S Campus Farmer's Market has been bringing a taste of the Farmer's Market to the campus community. 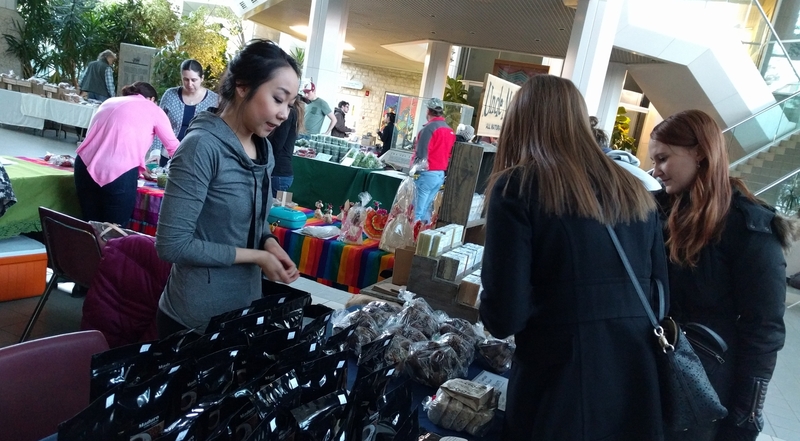 A collaboration between the Office of Sustainability, the USSU, and the Saskatoon Farmer's Market, the U of S Campus Farmer's Market operates on a monthly basis from September to May in the Place Riel North Concourse. The Market seeks to provide a mechanism for local vendors to market their wares for the campus community. All are welcome to apply for a vendor stall by filling out the online application form at the link below. The U of S Campus Farmer's Market will operate on a monthly basis from September through May. Setup will open at 8:30am each morning of the U of S Campus Farmer's Market. Vendors will set up in the North Concourse of the building. Parking can be difficult on campus, but those load-in and load-out is usually very quick and effective in the parking loop in front of Louis'. Vendors wanting to set up at the U of S Campus Farmer's Market must complete the Vendor Application Form. Vendors selling food must also submit an “Application to Sell Food at a Farmer’s Market” to the Facilities Manager for approval from the Health Region. Applicants will be notified which days they are selected to set up at the U of S Campus Farmer's Market. We have moved to MailChimp as our primary means of communicating with our vendors. Please ensure that you check your junk mail/spam folders to make sure that your e-mail client is not filtering out our messages. The U of S Campus Farmer's Market will host 10 rotating vendors at each market. Vendors will be selected based on the desired ratio of vendors goods outlined in the section above. An 11th table will host the USSU Food Centre's Fresh Food Market each week. Some items are not permitted at the U of S Campus Farmer's Market. Please see the list of restricted items in the appropriate section below. There is a $25 fee to set up for a day at the U of S Campus Farmer's Market. It can be paid upon arrival at the USSU Front Desk in Upper Place Riel. Cash, debit, and credit card are accepted. Each vendor will be allotted one 3'x6' table. Please bring table covering as desired. The U of S Campus Farmer's Market is located in the North Concourse of Place Riel at 1 Campus Drive. Parking will be in Lot 1 located in front of Place Riel. Parking fees will be $2 per hour paid by the vendor. If after parking you require the use of a dolly, one can be picked up in the North Concourse from the USSU Front Desk. Alternatively, unloading can occur at the loading zone located directly in front of the building in the transit area. This loading zone can only accommodate two small vehicles at a time and can not block any bus parking. If this method is chosen, we will have volunteers available to watch goods while the vendor promptly leaves to park their vehicle. Place Riel will be open at 8:30am for setup. Loading can occur from the parking lot or at the loading zone in front of Place Riel located in the transit area. All vendors will sign in at the USSU desk in Upper Place Riel. The $25 vendor fee is payable at this time. Once signed in, vendors will receive their table number and location. Cookies and muffins are not permitted. Any meal that requires on the spot preparation is not permitted. Hot meals including pizza, sushi, rice & veggie bowls, pitas, smoothies, burgers, fries, or crepes are not permitted. To support this goal, all items sold at the U of S Campus Market must be handmade, locally sourced, or support sustainability in some way. All food items offered for sale at the U of S Campus Market must meet the approval of the public health authority. 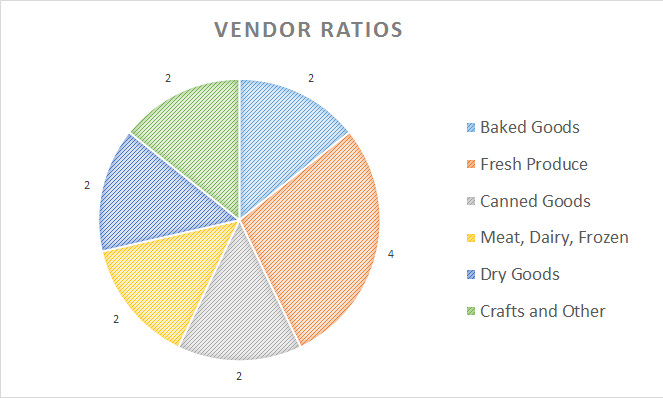 These vendor ratios are approximate and may vary depending on season. We encourage whole loaves, whole pies, and baked goods sold by the dozen. Please see restricted items below. Open for fresh vegetable and fruit sellers. Priority for 1 table will be given to the Campus Horticulture Club. Dried and canned food items including sauces, salsas, jams, and jellies. A small number of electrical outlets are available, though we are unable to provide refrigerators or freezers. Cooked foods/meals cannot be sold in accordance with our agreements with the existing vendors in Place Riel. Dried herbs, dried fruits, candies, jerky, grains, or dry pasta. Non-food items that are artisanal in quality.